Napoleon came from a noble and moderately affluent Corsican family, which afforded him opportunities to gain quality education and marked his youth with commitment to Corsican nationalism. Napoleon was born in 1769 to Carlo Maria di Buonaparte and Maria Letizia Ramolino, in his family’s ancestral home Casa Buonaparte in Ajaccio, the capital of the island of Corsica. This was a year after the island was transferred to France by the Republic of Genoa. The Corsican origins and Corsica’s history would play a very important role in Napoleon’s upbringing and shape his first political fascinations and activism. His first language was Corsican and he always spoke French with a marked Corsican accent. Napoleon’s father Nobile Carlo Buonaparte, an attorney, was named Corsica’s representative to the court of Louis XVI in 1777. The dominant influence of Napoleon’s childhood was his mother, Letizia Ramolino, whose firm discipline restrained a rambunctious child. Napoleon was piously raised as a Catholic but never developed much faith. Napoleon’s noble, moderately affluent background afforded him greater opportunities to study than available to a typical Corsican of the time. In 1779, he was enrolled at a religious school in Autun but the same year, he was admitted to a military academy at Brienne-le-Château. On completion of his studies at Brienne in 1784, Napoleon was admitted to the elite École Militaire in Paris. Upon graduating in 1785, Bonaparte was commissioned a second lieutenant in La Fère artillery regiment. He served in Valence and Auxonne until after the outbreak of the Revolution in 1789, and took nearly two years’ leave in Corsica and Paris during this period. At this time, he was a fervent Corsican nationalist. He returned to Corsica and came into conflict with Paoli, who had decided to split with France and sabotage the French assault on the Sardinian island of La Maddalena. Bonaparte and his family fled to the French mainland in 1793 because of the split with Paoli. Historians emphasize the strength of the ambition that took Napoleon from an obscure village in Corsica to command of most of Europe. He was famously not very tall and thus not a physically imposing man, but his personality was described as “hypnotic.” Napoleon maintained strict, efficient work habits, prioritizing what needed to be done. Corsica: An island in the Mediterranean Sea and one of the 18 regions of France. It is located west of the Italian Peninsula, southeast of the French mainland, and north of the Italian island of Sardinia. After being ruled by the Republic of Genoa since 1284, it was briefly independent from 1755 until it was conquered by France in 1769. Due to its historical ties with the Italian peninsula, the island retains many elements of Italian culture. deist: An advocate of a theological/philosophical position that combines the rejection of revelation and authority as a source of religious knowledge with the conclusion that reason and observation of the natural world are sufficient to determine the existence of a single creator of the universe. Napoleon Bonaparte (1769 – 1821) was a French military and political leader who rose to prominence during the French Revolution and led several successful campaigns during the Revolutionary Wars. As Napoleon I, he was Emperor of the French from 1804 until 1814, and again in 1815. Napoleon was born in 1769 to Carlo Maria di Buonaparte and Maria Letizia Ramolino, in his family’s ancestral home Casa Buonaparte in Ajaccio, the capital of the island of Corsica. He was their fourth child and third son. This was a year after the island was transferred to France by the Republic of Genoa. The Corsican origins and Corsica’s history would play a very important role in Napoleon’s upbringing and shape his first political fascinations and activism. His first language was Corsican and he always spoke French with a marked Corsican accent. Portrait of Carlo Maria Buonaparte, father of Napoleon Bonaparte, by an unknown artist. This is one of few portraits of Napoleon’s father. In this half–length posthumous portrait, Carlo Maria (1746-1785) is dressed as a gentleman of the Ancien Régime with powdered wig and a coat laced with gold. Carlo was a Corsican lawyer and politician who briefly served as a personal assistant of the revolutionary leader Pasquale Paoli and eventually rose to become Corsica’s representative to the court of Louis XVI. After his death, while Napoleon became Emperor of the French, several of his other children received royal titles from their brother. The Corsican Buonapartes descended from minor Italian nobility of Tuscan origin who had come to Corsica from Liguria in the 16th century. Napoleon’s father Nobile Carlo Buonaparte was an attorney and was named Corsica’s representative to the court of Louis XVI in 1777. The dominant influence of Napoleon’s childhood was his mother, Letizia Ramolino, whose firm discipline restrained a rambunctious child. He had an elder brother, Joseph, and six younger siblings; two other siblings who died in infancy were born before Joseph. Napoleon was baptized as a Catholic. He was christened Napoleone di Buonaparte and adopted the more French-sounding Napoléon Bonaparte in his 20s. He was piously raised as a Catholic but never developed much faith. As an adult, Napoleon was a deist and his deity was an absent and distant God. However, he had a keen appreciation of the power of organized religion in social and political affairs and paid a great deal of attention to bending it to his purposes. He later noted the influence of Catholicism’s rituals and splendors in his life. Letizia Ramolino by Robert Lefèvre, 1813. Letizia was reportedly a harsh mother and down-to-earth woman. When most European mothers bathed children perhaps once a month, she had her children bathed every other day. Letizia spoke Italian and Corsican and never learned French. When she was 35, her husband died of cancer. She was decreed “Madam, the Mother of His Imperial Majesty The Emperor” (Madame Mère de l’Empereur), Imperial Highness in 1804 or 1805. On completion of his studies at Brienne in 1784, Napoleon was admitted to the elite École Militaire in Paris. He trained to become an artillery officer and completed the two-year course in one year when his father’s death reduced his income. He was the first Corsican to graduate from the École Militaire. Upon graduating in 1785, Bonaparte was commissioned a second lieutenant in La Fère artillery regiment. He served in Valence and Auxonne until after the outbreak of the Revolution in 1789, and took nearly two years’ leave in Corsica and Paris during this period. At this time, he was a fervent Corsican nationalist and wrote to Corsican leader Pasquale Paoli in 1789, “As the nation was perishing I was born. Thirty thousand Frenchmen were vomited on to our shores, drowning the throne of liberty in waves of blood. Such was the odious sight which was the first to strike me.” He spent the early years of the Revolution in Corsica, fighting in a complex three-way struggle among royalists, revolutionaries, and Corsican nationalists. He was a supporter of the republican Jacobin movement, organizing clubs in Corsica, and was given command over a battalion of volunteers. He was promoted to captain in the regular army in July 1792, despite exceeding his leave of absence and leading a riot against a French army in Corsica. He returned to Corsica and came into conflict with Paoli, who decided to split with France and sabotage the French assault on the Sardinian island of La Maddalena. Bonaparte and his family fled to the French mainland in 1793 because of the split with Paoli. Historians emphasize the strength of the ambition that took Napoleon from an obscure village in Corsica to command of most of Europe. He was famously not very tall and thus not a physically imposing man, but his personality was described as “hypnotic.” Napoleon maintained strict, efficient work habits, prioritizing what needed to be done. He had to win at everything he attempted. He kept relays of staff and secretaries at work. Unlike many generals, Napoleon did not examine history to see what great leaders might have done in a similar situation. Historians also note that while he understood military technology, he was not an innovator in that regard and some of his victories heightened his sense of self-grandiosity and left him certain of his destiny and invincibility. In terms of influence on events, it was more than Napoleon’s personality that took effect. He reorganized France to supply the men and money needed for wars and was reportedly an incredibly inspiring leader on the battlefield. Napoleon rose to prominence as a military leader during the French Revolutionary Wars. His 20-year military career earned him remembrance as one of the finest commanders in world history and a military genius. Criticize Napoleon’s military record and examine the extent to which he was a hero of the Republic. Upon graduating from the prestigious École Militaire in Paris in 1785, Bonaparte was commissioned a second lieutenant in an artillery regiment. He served in Valence and Auxonne until after the outbreak of the Revolution in 1789. He spent the early years of the Revolution in Corsica, fighting in a complex three-way struggle among royalists, revolutionaries, and Corsican nationalists. He was promoted to captain in the regular army in 1792. Napoleon would witness the effects of Parisian mob violence against trained troops and became an exemplary officer in defense of revolutionary ideals. His firm beliefs would lead him to fight his own people, initially at the Siege of Toulon, where he would play a major role in crushing the royalist rebellion. Promoted to general in 1795, Napoleon was sent to fight the Austro-Piedmontese armies in Northern Italy the following year. In less than a year, French armies under Napoleon decimated the Habsburg forces and evicted them from the Italian peninsula. With French forces marching towards Vienna, the Austrians agreed to the Treaty of Campo Formio, ending the First Coalition against the Republic. The War of the Second Coalition began with the French invasion of Egypt, headed by Napoleon in 1798. His forces annihilated a series of Egyptian and Ottoman armies at the battles of the Pyramids, Mount Tabor, and Abukir. These victories and the conquest of Egypt further enhanced Napoleon’s popularity back in France. He returned in the fall of 1799 to cheering throngs in the streets despite the Royal Navy’s critical triumph at the Battle of the Nile in 1798. Napoleon’s arrival from Egypt led to the fall of the Directory in the Coup of 18 Brumaire, with Napoleon installing himself as Consul. He then reorganized the French army and launched a new assault against the European Coalition In 1802, with Austria and Russia out of the war, the United Kingdom found itself increasingly isolated and agreed to the Treaty of Amiens, concluding the Revolutionary Wars. The lingering tensions proved too difficult to contain, however, and the Napoleonic Wars began a few years later with the formation of the Third Coalition. The military career of Napoleon Bonaparte lasted more than 20 years. He is widely regarded as a military genius and one of the finest commanders in world history. He fought 60 battles and lost just seven, most at the end of his career. Siege of Toulon: A military siege of republican forces over a royalist rebellion in the southern French city of Toulon that took place between September 8 and December 19, 1793. The royalists were supported by British, Spanish, Neapolitan, and Piedmontese troops. French Revolutionary Wars: A series of sweeping military conflicts lasting from 1792 until 1802, resulting from the French Revolution. They pitted the French First Republic against Britain, Austria, and several other monarchies. They are divided in two periods: the War of the First Coalition (1792–1797) and the War of the Second Coalition (1798–1802). Initially confined to Europe, the fighting gradually assumed a global dimension as the political ambitions of the Revolution expanded. Directory: A five-member committee that governed France from November 1795, when it replaced the Committee of Public Safety, until it was overthrown by Napoleon Bonaparte in the Coup of 18 Brumaire (November 8-9, 1799) and replaced by the Consulate. It gave its name to the final four years of the French Revolution. Coup of 18 Brumaire: A bloodless coup d’état under the leadership of Napoleon Bonaparte that overthrew the Directory, replacing it with the French Consulate. It took place on November 9, 1799, 18 Brumaire, Year VIII under the French Republican Calendar. Napoleon’s noble, moderately affluent background afforded him greater opportunities to study than available to a typical Corsican of the time. Upon graduating from the prestigious École Militaire (military academy) in Paris in 1785, Bonaparte was commissioned as a second lieutenant in an artillery regiment. He served in Valence and Auxonne until after the outbreak of the Revolution in 1789 and took nearly two years’ leave in Corsica (where he was born and spent his early years) and Paris during this period. At this time, he was a fervent Corsican nationalist. He spent the early years of the Revolution in Corsica, fighting in a complex three-way struggle among royalists, revolutionaries, and Corsican nationalists. He was a supporter of the republican Jacobin movement, organizing clubs in Corsica, and was given command over a battalion of volunteers. He was promoted to captain in the regular army in 1792, despite exceeding his leave of absence and leading a riot against a French army in Corsica. Napoleon would witness the effects of Parisian mob violence against trained troops and became an exemplary officer in defense of revolutionary ideals. His firm beliefs would lead him to fight his own people, initially at the Siege of Toulon where he played a major role in crushing the royalist rebellion by expelling an English fleet and securing the valuable French harbor. Almost two years later, he faced an uprising in the heart of Paris, again utilizing his skills as a gunner. Promoted to general in 1795, Napoleon was sent to fight the Austro-Piedmontese armies in Northern Italy the following year. After defeating both armies, he became France’s most distinguished field commander. The French Revolutionary Wars began from increasing political pressure on King Louis XVI of France to prove his loyalty to the country’s new direction. In the spring of 1792, France declared war on Prussia and Austria, who responded with a coordinated invasion of the country. By 1795, the French monarchy had failed and the French army had recorded both triumphs and failures, but the French had captured the Austrian Netherlands and knocked Spain and Prussia out of the war with the Peace of Basel. Hitherto unknown general Napoleon Bonaparte began his first campaign in Italy in April 1796. In less than a year, French armies under Napoleon decimated the Habsburg forces and evicted them from the Italian peninsula, winning almost every battle and capturing 150,000 prisoners. With French forces marching towards Vienna, the Austrians sued for peace and agreed to the Treaty of Campo Formio, ending the First Coalition against the Republic. The War of the Second Coalition began with the French invasion of Egypt, headed by Napoleon in 1798. The Allies took the opportunity presented by the French strategic effort in the Middle East to regain territories lost from the First Coalition. Napoleon’s forces annihilated a series of Egyptian and Ottoman armies at the battles of the Pyramids, Mount Tabor, and Abukir. These victories and the conquest of Egypt further enhanced Napoleon’s popularity back in France. He returned in the fall of 1799 to cheering throngs in the streets despite the Royal Navy’s critical triumph at the Battle of the Nile in 1798. This humiliating defeat further strengthened British control of the Mediterranean. Battle of the Pyramids on July 21, 1798 by Louis-François, Baron Lejeune, 1808. The Egyptian campaign ended in what some in France believed was a failure, with 15,000 French troops killed in action and 15,000 by disease. However, Napoleon’s reputation as a brilliant military commander remained intact and even rose higher despite his failures during the campaign. This was due to his expert propaganda designed to bolster the expeditionary force and improve its morale. That propaganda even spread back to France, where news of defeats such as at sea in Aboukir Bay and on land in Syria were suppressed. Napoleon’s arrival from Egypt led to the fall of the Directory in the Coup of 18 Brumaire, with Napoleon installing himself as Consul. Napoleon then reorganized the French army and launched a new assault against the Austrians in Italy during the spring of 1800. This latest effort culminated in a decisive French victory at the Battle of Marengo in June 1800, after which the Austrians withdrew from the peninsula once again. Another crushing French triumph at Hohenlinden in Bavaria forced the Austrians to seek peace for a second time, leading to the Treaty of Lunéville in 1801. With Austria and Russia out of the war, the United Kingdom found itself increasingly isolated and agreed to the Treaty of Amiens with Napoleon’s government in 1802, concluding the Revolutionary Wars. The lingering tensions proved too difficult to contain, however, and the Napoleonic Wars began a few years later with the formation of the Third Coalition, continuing the series of Coalition Wars. The military career of Napoleon Bonaparte lasted more than 20 years. He is widely regarded as a military genius and one of the finest commanders in world history. He fought 60 battles and lost only seven, most of these at the end of his career. In the field of military organization, Napoleon borrowed from previous theorists and reforms of preceding French governments, developing much of what was already in place. He continued the policy that emerged from the Revolution of promotion based primarily on merit. Corps replaced divisions as the largest army units, mobile artillery was integrated into reserve batteries, the staff system became more fluid, and cavalry returned as an important formation in French military doctrine. These methods are now referred to as essential features of Napoleonic warfare. Napoleon’s biggest influence was in the conduct of warfare. Antoine-Henri Jomini explained Napoleon’s methods in a widely used textbook that influenced all European and American armies. Influential military theorist Carl von Clausewitz regarded Napoleon as a genius in the operational art of war and historians rank him as a great military commander. Under Napoleon, a new emphasis towards the destruction, not just outmaneuvering, of enemy armies emerged. Invasions of enemy territory occurred over broader fronts, which made wars costlier and more decisive. The political effect of war increased. Defeat for a European power meant more than the loss of isolated enclaves, intensifying the Revolutionary phenomenon of total war. Napoleon’s marriage to Josephine was based on love and passion rather than political gain. However, it was ended for political reasons when it became clear that Josephine was unable to bear an heir. Marie Josèphe Rose Tascher de La Pagerie was born in 1763 in Martinique to a wealthy white Creole family that owned a sugarcane plantation. In 1779, she married Alexandre de Beauharnais, with whom she had two children. The marriage was not a happy one, leading to a court-ordered separation. In 1794, during the Reign of Terror, Alexandre was executed but Josephine was freed thanks to the fall and execution of Robespierre. Josephine met Napoleon, six years her junior, in 1795. Napoleon was enamored with Josephine, with whom he had a passionate affair. In January 1796, Bonaparte proposed to Josephine and they married in March. Until meeting Bonaparte, Josephine was known as Rose, but Bonaparte preferred to call her Josephine, the name she adopted from then on. The marriage was not well received by Napoleon’s family, who were shocked that he had married an older widow with two children. Two days after the wedding, Bonaparte left to lead the French army in Italy. During their separation he sent her many love letters, but both spouses also had lovers. Despite his own affairs, their relationship was never the same after he learnt about hers. The coronation ceremony, officiated by Pope Pius VII, took place at Notre Dame de Paris in December 1804. Following prearranged protocol, Napoleon first crowned himself, then put the crown on Josephine’s head, proclaiming her empress. When after a few years it became clear Josephine could not have a child, Napoleon, though he still loved his wife, began to think seriously about the possibility of divorce and created lists of eligible princesses. In November 1809, he let Josephine know that in the interest of France he must find a wife who could produce an heir. Despite her anger, Josephine agreed to the divorce so the Emperor could remarry in the hope of having an heir. Despite his divorce from Josephine, he showed his dedication to her for the rest of his life. When he heard the news of her death while on exile in Elba, he locked himself in his room and would not come out for two days. Her name would also be his final word on his deathbed in 1821. Reign of Terror: A period of violence during the French Revolution incited by conflict between two rival political factions, the Girondins and the Jacobins, and marked by mass executions of “the enemies of the revolution.” The death toll ranged in the tens of thousands, with 16,594 executed by guillotine and another 25,000 in summary executions across France. Marie Josephe Rose Tascher de La Pagerie was born in 1763 in Martinique to a wealthy white Creole family that owned a sugarcane plantation. The family struggled financially after hurricanes destroyed their estate in 1766. Josephine’s aunt arranged the advantageous marriage of Josephine’s younger sister, Catherine-Désirée, to Alexandre de Beauharnais, a member of an influential and wealthy family. However, when Catherine died in 1777, she was replaced by her older sister, Josephine, who married Alexandre in 1779 in France. The couple had two children. The marriage was an unhappy one, leading to a court-ordered separation. In 1794, during the Reign of Terror, Alexandre was arrested and jailed and Josephine, considered too close to the counter-revolutionary financial circles, was also imprisoned. She was freed five days after Alexandre’s execution thanks to the fall and execution of Robespierre, which ended the Reign of Terror. Josephine met Napoleon, six years her junior, in 1795. Prior to that, she had had affairs with several leading political figures, including Paul François Jean Nicolas Barras. Napoleon was enamored with Josephine, with whom he had a passionate affair. In a letter to her from December 1795, he wrote, “I awake full of you. Your image and the memory of last night’s intoxicating pleasures has left no rest to my senses.” In January 1796 Bonaparte proposed to Josephine, and they married in March. Until meeting Bonaparte, Josephine was known as Rose, but Bonaparte preferred to call her Josephine, the name she adopted from then on. During Napoleon’s absence, Josephine had lovers, including lieutenant Hippolyte Charles. A letter Charles wrote about the affair was intercepted by the British and published widely in order to embarrass Napoleon. The relationship between Josephine and Napoleon was never the same after this. His letters became less loving. No subsequent lovers of Josephine are recorded, but Napoleon had sexual affairs with several other women. Miniature portrait of the Empress by Jean Baptiste Isabey on a gold snuff box crafted by the Imperial goldsmith Adrien-Jean-Maximilien Vachette, circa 1810. Josephine was a renowned spendthrift and Barras may have encouraged the relationship with Napoleon to get her off his hands. Napoleon reportedly said that the only thing to come between them was her debts. Despite the affairs of both spouses and the eventual divorce, evidence suggests that Napoleon and Josephine loved each other deeply throughout their lives. The coronation ceremony, officiated by Pope Pius VII, took place at Notre Dame de Paris in December 1804. Following prearranged protocol, Napoleon first crowned himself, then put the crown on Josephine’s head proclaiming her empress. Shortly before their coronation, Josephine caught Napoleon in the bedroom of her lady-in-waiting, Elisabeth de Vaudey, and Napoleon threatened to divorce her as she had not produced an heir. Eventually, through the efforts of Josephine’s daughter Hortense, the two reconciled. When it became clear Josephine could not have a child, Napoleon began to think seriously about the possibility of divorce. The final die was cast when Josephine’s grandson Napoleon Charles Bonaparte, who had been declared Napoleon’s heir, died of croup in 1807. Napoleon began to create lists of eligible princesses. In November 1809, he let Josephine know that—in the interest of France—he must find a wife who could produce an heir. Despite her anger, Josephine agreed to the divorce so the Emperor could remarry in the hope of having an heir. The divorce ceremony took place in January 1810 and was a grand but solemn social occasion. Both Josephine and Napoleon read a statement of devotion to the other. In March 1810, Napoleon married Marie-Louise of Austria by proxy and the formal ceremony took place at the Louvre in April. Napoleon once remarked after marrying Marie-Louise that despite her quick infatuation with him “he had married a womb.” Even after their separation, Napoleon insisted Josephine retain the title of empress. Despite his divorce from Josephine, he showed his dedication to her for the rest of his life. When he heard the news of her death while on exile in Elba, he locked himself in his room and would not come out for two days. Her name would also be his final word on his deathbed in 1821. Napoleon’s consolidation of power was initiated by a coup and continued in a series of political maneuvers, but his rise as the sole ruler of France was linked with the power and popularity he gained as the foremost military leader. After Habsburg-controlled Austria declared war in 1799, France returned to a war footing. With Napoleon and the republic’s best army engaged in the Egypt and Syria campaign, France suffered a series of reverses in Europe. The Coup of 30 Prairial VII (June 18) ousted the Jacobins and left Emmanuel Joseph Sieyès as the dominant figure in the government. As France’s military situation improved, the Jacobins feared a revival of the pro-peace Royalist faction. When Napoleon returned to France in October, both factions hailed him as the country’s savior. Despite the failures in Egypt, Napoleon returned to a hero’s welcome, which convinced Sieyès he had found the general indispensable to his planned coup. However, from the moment of his return, Napoleon plotted a coup within the coup, ultimately gaining power for himself rather than Sieyès. On the 18 of Brumaire, three of the five Directors resigned, which prevented a quorum and thus practically abolished the Directory. The two remaining Directors protested, but were arrested and forced to give up their resistance. Both Councils resisted but eventually succumbed to the demands of the plotters. The plotters convened two commissions that they intimidated into declaring a provisional government, the first form of the Consulate with Napoleon, Sieyès, and Ducos as Consuls. The commissions then drew up the Constitution of the Year VIII (1799). Originally devised by Sieyès to give Napoleon a minor role but rewritten by Napoleon and accepted by direct popular vote, the Constitution preserved the appearance of a republic but in reality established a dictatorship. Bonaparte completed his coup within a coup by the adoption of a constitution under which the First Consul, a position he was sure to hold, had greater power than the other two consuls. Under the new constitution, The Sénat conservateur verified the draft bills and directly advised the First Consul; Conseil d’État drafted bills; Tribunat debated bills but could not vote on them; and Corps législatif voted on laws deliberated before the Tribunat. ten years but for life, as a recompense from the nation. The decision was approved in a referendum. Coup of 18 Brumaire: A bloodless coup d’état under the leadership of Napoleon Bonaparte that overthrew the Directory, replacing it with the French Consulate. It took place on November 9, 1799, which was 18 Brumaire, Year VIII under the French Republican Calendar. Directory: A five-member committee that governed France from November 1795 when it replaced the Committee of Public Safety until it was overthrown by Napoleon Bonaparte in the Coup of 18 Brumaire (November 8-9, 1799) and replaced by the Consulate. It gave its name to the final four years of the French Revolution. Conseil d’État: (French: Council of State): A body of the French national government that acts both as legal adviser of the executive branch and as the supreme court for administrative justice. Originally established in 1799 by Napoleon Bonaparte as a successor to the King’s Council and a judicial body mandated to adjudicate claims against the State and assist in the drafting of important laws. Corps législatif: A part of the French legislature during the French Revolution and beyond. During the period of the French Directory beginning in 1795, the Corps législatif referred to the bicameral legislature of the Council of Five Hundred and the Council of Ancients. Under Napoleon’s Consulate, this was the law-making body of the three-part government apparatus (alongside the Tribunat and the Sénat Conservateur). At the time, its role consisted solely of voting on laws deliberated before the Tribunat. Coup of 30 Prairial: A bloodless coup, also known as the Revenge of the Councils, that occurred in France on June 18, 1799—30 Prairial Year VII by the French Republican Calendar. It left Emmanuel-Joseph Sieyès as the dominant figure of the French government and prefigured the Coup of 18 Brumaire that brought Napoleon Bonaparte to power. Sénat conservateur: An advisory body established in France during the Consulate following the French Revolution. It was established in 1799 under the Constitution of the Year VIII following the Napoleon Bonaparte-led Coup of 18 Brumaire. It lasted until 1814 when Napoleon Bonaparte was overthrown and the Bourbon monarchy was restored, and was a key element in Napoleon’s regime. Tribunat: One of the four assemblies set up in France by the Constitution of Year VIII (the other three were the Council of State, the Corps législatif and the Sénat conservateur). It was set up officially in 1800 at the same time as the Corps législatif. It assumed some of the functions of the Council of Five Hundred, but its role consisted only of deliberating projected laws before their adoption by the Corps législatif, with the legislative initiative remaining with the Council of State. the Consulate: The government of France from the fall of the Directory in the Coup of 18 Brumaire (1799) until the start of the Napoleonic Empire in 1804. By extension, the term also refers to this period of French history. During this period, Napoleon Bonaparte, as First Consul, established himself as the head of a more liberal, authoritarian, autocratic, and centralized republican government in France while not declaring himself head of state. After Habsburg-controlled Austria declared war in 1799, France returned to a war footing. Emergency measures were adopted and the pro-war Jacobin faction triumphed in the election. With Napoleon and the republic’s best army engaged in the Egypt and Syria campaign, France suffered a series of reverses in Europe. The Coup of 30 Prairial VII (June 18) ousted the Jacobins and left Emmanuel Joseph Sieyès, a member of the five-man ruling Directory, the dominant figure in the government. As France’s military situation improved, the Jacobins feared a revival of the pro-peace Royalist faction. When Napoleon returned to France in October, both factions hailed him as the country’s savior. Despite the failures in Egypt, Napoleon returned to a hero’s welcome, which convinced Sieyès he had found the general indispensable to his planned coup. However, from the moment of his return, Napoleon plotted a coup within the coup, ultimately gaining power for himself rather than Sieyès. Prior to the coup, troops were conveniently deployed around Paris. The plan was first to persuade the Directors to resign, then to get the Council of Ancients and the Council of Five Hundred (the upper and lower houses of the legislature) to appoint a pliant commission that would draw up a new constitution to the plotters’ specifications. The plan succeeded. On the morning of 18 Brumaire, Lucien Bonaparte falsely persuaded the Councils that a Jacobin coup was at hand in Paris and induced them to depart for the safety in the suburbs, while Napoleon was charged with the safety of the two Councils and given command of all available local troops. On the same day, three of the five Directors resigned, which prevented a quorum and thus practically abolished the Directory. The two remaining Directors protested but were arrested and forced to give up their resistance. By the following day, the deputies of the Councils realized that they were facing an attempted coup rather than being protected from a Jacobin rebellion. Faced with their recalcitrance, Napoleon stormed into the chambers, which proved to be the coup within the coup: from this point, it was a military affair. Both chambers resisted but under the pressure of the events, they succumbed to the demands of the plotters. The Directory was crushed, but the coup within the coup was not yet complete. The use of military force had certainly strengthened Napoleon’s hand vis à vis Sieyès and the other plotters. With the Council routed, the plotters convened two commissions, each consisting of 25 deputies from the two Councils. The plotters essentially intimidated the commissions into declaring a provisional government, the first form of the Consulate with Napoleon, Sieyès, and Roger Ducos as Consuls. The lack of reaction from the streets proved that the revolution was indeed over. Resistance by Jacobin officeholders in the provinces was quickly crushed. The commissions then drew up the Constitution of the Year VIII (1799), the first of the constitutions since the Revolution without a Declaration of Rights. Originally devised by Sieyès to give Napoleon a minor role but rewritten by Napoleon and accepted by direct popular vote, the Constitution preserved the appearance of a republic but in reality established a dictatorship. A portrait of the three Consuls, Jean Jacques Régis de Cambacérès, Napoleon Bonaparteand Charles-François Lebrun (left to right) by Henri-Nicolas Van Gorp. Sieyès and Ducos survived only two months as members of the Consulate. In December 1799, two new members (in the portrait above) joined Napoleon. As the years would progress, he would move to consolidate his own power as First Consul and leave the two other consuls, Jean Jacques Régis de Cambacérès and Charles-François Lebrun, duc de Plaisance, as well as the Assemblies, weak and subservient. By consolidating power, Bonaparte was able to transform the aristocratic constitution of Sieyès into a dictatorship. Bonaparte thus completed his coup within a coup by the adoption of a constitution under which the First Consul, a position he was sure to hold, had greater power than the other two. In particular, he appointed the Senate and the Senate interpreted the constitution. The Sénat conservateur (Conservative Senate, which verified the draft bills and directly advised the First Consul on the implications of such bills) allowed him to rule by decree, so the more independent Conseil d’État (Council of State, which drafted bills) and Tribunat (debated bills but could not vote on them) were relegated to unimportant roles. The legislature known as Corps législatif also partly replaced the Council of Five Hundred under the new constitution, but its role consisted solely of voting on laws deliberated before the Tribunat. Napoleon’s early wars with Austria and Britain confirmed the French dominance over Austria, failed to stop British dominance in the Mediterranean, and ended with a precarious peace broken only a year after signing the final treaty of the French Revolutionary Wars. The War of the First Coalition (1792–1797) was the first attempt by the European monarchies to defeat the French First Republic. France declared war on the Habsburg Monarchy of Austria in April 1792 and the Kingdom of Prussia joined the Austrian side a few weeks later. A number of other European states, including Britain, joined the First Coalition over the course of the war. Napoleon did not enter the war as the leader of the French army until 1796, although he faced the British forces at the 1793 Siege of Toulon, where he played a major role in crushing the royalist rebellion by expelling an English fleet and securing the valuable French harbor. Promoted to general in 1795, he was sent to the battlefields of the French Revolutionary Wars to fight the Austro-Piedmontese armies in Northern Italy the following year. Napoleon was successful in a daring invasion of Italy, a victory that contributed to Austria’s decision to sign the Treaty of Campo Formio, ceding Belgium to France and recognizing French control of the Rhineland and much of Italy. The ancient Republic of Venice was partitioned between Austria and France. This ended the War of the First Coalition, although Great Britain and France remained at war. The Mediterranean campaign of 1798 was a series of major naval operations surrounding a French expeditionary force sent to Egypt under Napoleon Bonaparte that serves as a bridge between the War of the First Coalition and the War of the Second Coalition. The French Republic sought to capture Egypt as the first stage in an effort to threaten British India and thus force Great Britain to make peace. The campaign was initially Napoleon’s success but he failed to stop the British dominance once it moved to Egypt. The War of the Second Coalition (1798–1802) was the second war on revolutionary France by the European monarchies, led by Britain, Austria and Russia, and including the Ottoman Empire, Portugal, and Naples. Their goal was to contain the spread of chaos from France. In the end, the Austrians negotiated the Treaty of Lunéville, basically accepting the terms of the previous Treaty of Campo Formio. In Egypt, the Ottomans and British invaded and finally compelled the French to surrender after the fall of Cairo and Alexandria. In 1802, the British and French signed the Treaty of Amiens but the peace did not last long. War of the First Coalition: The 1792–1797 conflict of the French Revolutionary Wars that was the first attempt by the European monarchies to defeat the French First Republic. France declared war on the Habsburg Monarchy of Austria in April 1792 and the Kingdom of Prussia joined the Austrian side a few weeks later. A number of smaller states, including Spain, Portugal, and the Dutch Republic, also joined the anti-French coalition. War of the Second Coalition: The 1798–1802 conflict that was the second war on revolutionary France by the European monarchies, led by Britain, Austria, and Russia and including the Ottoman Empire, Portugal, and Naples. Their goal was to contain the spread of chaos from France. Mediterranean campaign of 1798: A series of major naval operations surrounding a French expeditionary force sent to Egypt under Napoleon Bonaparte during the French Revolutionary Wars. The French Republic sought to capture Egypt as the first stage in an effort to threaten British India and thus force Great Britain to make peace. The War of the First Coalition (1792–1797), one of the conflicts of the French Revolutionary Wars, was the first attempt by the European monarchies to defeat the French First Republic. France declared war on the Habsburg Monarchy of Austria in April 1792 and the Kingdom of Prussia joined the Austrian side a few weeks later. These powers made several invasions of France by land and sea, with Prussia and Austria attacking from the Austrian Netherlands and the Rhine and the Kingdom of Great Britain supporting revolts in provincial France and laying siege to Toulon. A number of smaller states, including Spain, Portugal, and the Dutch Republic, were also part of the First Coalition over the course of the war. Napoleon did not enter the war as the leader of the French army until 1796, although he faced the British forces at the 1793 Siege of Toulon, where he played a major role in crushing the royalist rebellion by expelling an English fleet and securing the valuable French harbor. Promoted to general in 1795, Napoleon was sent to the battlefields of the French Revolutionary Wars to fight the Austro-Piedmontese armies in Northern Italy the following year. Napoleon’s was one of three French armies sent with the aim to eventually reach Vienna (two other engaged in the campaign on the Rhine). He was successful in a daring invasion of Italy. In the Montenotte Campaign, he separated the armies of Sardinia and Austria, defeating each one in turn, and then forced a peace on Sardinia. His army then captured Milan and started the Siege of Mantua. Bonaparte defeated successive Austrian armies sent against him while continuing the siege. In February, Napoleon finally captured Mantua, with the Austrians surrendering 18,000 men. Archduke Charles of Austria was unable to stop Napoleon from invading the Tyrol and the Austrian government sued for peace in April. At the same time there was a new French invasion of Germany under Moreau and Hoche. Austria signed the Treaty of Campo Formio in October, ceding Belgium to France and recognizing French control of the Rhineland and much of Italy. The ancient Republic of Venice was partitioned between Austria and France. This ended the War of the First Coalition, although Great Britain and France remained at war. The Mediterranean campaign of 1798 was a series of major naval operations surrounding a French expeditionary force sent to Egypt under Napoleon Bonaparte that serves as a bridge between the War of the First Coalition and the War of the Second Coalition. The French Republic sought to capture Egypt as the first stage in an effort to threaten British India and thus force Great Britain to make peace. Departing Toulon in May 1798 with over 40,000 troops and hundreds of ships, Bonaparte’s fleet sailed southeast across the Mediterranean Sea. They were followed by a small British squadron under Rear-Admiral Horatio Nelson, later reinforced to 13 ships of the line. Bonaparte’s first target was the island of Malta, which was under the government of the Knights of St. John and theoretically granted its owner control of the Central Mediterranean. Bonaparte’s forces landed on the island and rapidly overwhelmed the defenders, securing the port city of Valletta before continuing to Egypt. When Nelson learned of the French capture of the island, he guessed the French target to be Egypt and sailed for Alexandria. Napoleon’s arrival in Malta (unknown artist). Despite Napoleon’s initial successes, including the temporary capture of the port city Valletta in Malta, the defeats of French Navy in the Mediterranean encouraged a number of states to join the Second Coalition and go to war with France. Unable to find Bonaparte, Nelson turned back across the Mediterranean, eventually reaching Sicily. While Nelson was returning westwards, Bonaparte reached Alexandria and stormed the city, capturing the coast and marching his army inland. Nelson returned to the Egyptian coast and ordered an immediate attack on the French. Fighting continued for the next two days until all of the French ships had been captured, destroyed, or fled. At the Battle of the Nile, 11 French ships of the line and two frigates were eliminated, trapping Bonaparte in Egypt and changing the balance of power in the Mediterranean. With the French Navy in the Mediterranean defeated, other nations were encouraged to join the Second Coalition and go to war with France. Portugal, the Kingdom of Naples, the Russian Empire, and the Ottoman Empire all subsequently deployed forces to the Mediterranean. The Russians and Turks participated in the blockade of Egypt and operations in the Adriatic Sea while the Portuguese joined the Siege of Malta, distantly conducted by Nelson from his lodgings in Naples. The War of the Second Coalition (1798–1802) was the second war on revolutionary France by the European monarchies, led by Britain, Austria, and Russia and including the Ottoman Empire, Portugal and Naples. Their goal was to contain the spread of chaos from France. Alerted to the political and military crisis in France, Napoleon returned from Egypt, leaving his army behind, and used his popularity and army support to mount a coup that made him First Consul, the head of the French government. Napoleon sent General Moreau to campaign in Germany and went to raise a new army at Dijon and march through Switzerland to attack the Austrian armies in Italy from behind. Narrowly avoiding defeat, he defeated the Austrians at the Battle of Marengo and reoccupied northern Italy. Moreau meanwhile invaded Bavaria and won a great battle against Austria at Hohenlinden. He continued toward Vienna and the Austrians sued for peace. In one of the famous paintings of Napoleon, the Consul and his army are depicted crossing the Swiss Alps on their way to Italy. The daring maneuver surprised the Austrians and forced a decisive engagement at Marengo in 1800. Victory there allowed Napoleon to strengthen his political position back in France. The Austrians negotiated the Treaty of Lunéville, basically accepting the terms of the previous Treaty of Campo Formio. In Egypt, the Ottomans and British invaded and finally compelled the French to surrender after the fall of Cairo and Alexandria. Britain continued the war at sea. A coalition of non-combatants including Prussia, Russia, Denmark, and Sweden joined to protect neutral shipping from Britain’s blockade, resulting in Nelson’s surprise attack on the Danish fleet in harbor at the Battle of Copenhagen. In December 1801, an expedition was sent to Saint-Domingue to quell the revolution that had started there in 1791 once and for all, but the blockade of the Caribbean island by the British fleet made the sending of reinforcements impossible. In 1802, the British and French signed the Treaty of Amiens, ending the war. The treaty is generally considered to mark the transition between the French Revolutionary Wars and the Napoleonic Wars. The peace, however, did not last long. Great Britain had broken the Treaty of Amiens by declaring war on France in May 1803. In December 1804, an Anglo-Swedish agreement became the first step towards the creation of the Third Coalition. By April 1805, Britain had also signed an alliance with Russia. Austria had been defeated by France twice in recent memory and wanted revenge, so it joined the coalition a few months later. The Constitution of the Year VIII, adopted in 1799 and accepted by the popular vote in 1800, established the form of government known as the Consulate that presumed virtually dictatorial powers of the First Consul, Napoleon Bonaparte. Napoleon and his allies overthrew the Directory by a coup d’état on November 9, 1799 (the Coup of 18 Brumaire), closing down the Council of Five Hundred. Napoleon became the First Consul for ten years, appointing two consuls who had consultative voices only. His power was confirmed by the new Constitution of the Year VIII, which preserved the appearance of a republic but established a dictatorship. The Constitution of the Year VIII was adopted on December 24, 1799, and established the form of government known as the Consulate. The new government was composed of three parliamentary assemblies: the Council of State, which drafted bills; the Tribunate, which debated them but could not vote; and the Legislative Assembly, which could not discuss the bills, but whose members voted on them after reviewing the Tribunate’s debate record. The Conservative Senate (Sénat conservateur) was a governmental body equal to the three aforementioned legislative assemblies. The executive power was vested in three Consuls, but all actual power was held by the First Consul, Bonaparte, who never intended to be part of an equal triumvirate. As the years progressed, he moved to consolidate his own power as First Consul and leave the two other consuls and the Assemblies weak and subservient. On February 7, 1800, a public referendum confirmed the new constitution. It vested all of the real power in the hands of the First Consul, leaving only a nominal role for the other two consuls. Over 99% of voters approved the motion, according to the released results. While this near-unanimity is certainly doubtful, Napoleon was genuinely popular among many voters. The Constitution was amended twice and in each case, the amendments strengthened Napoleon’s already concentrated power. The Constitution of the Year X (1802) made Napoleon First Consul for Life. In 1804, the Constitution of the Year XII established the First French Empire with Napoleon Bonaparte as Napoleon I, Emperor of the French. The Constitution established the House of Bonaparte as France’s imperial dynasty, making the throne hereditary in Napoleon’s family. The Constitution of the Year XII was later extensively amended by the Additional Act (1815) after Napoleon returned from exile on Elba. The document virtually replaced the previous Napoleonic Constitutions. Constitution of the Year VIII: The French constitution adopted on December 24, 1799 (during the Year VIII of the French Revolutionary Calendar), that established the form of government known as the Consulate. The constitution tailor-made the position of First Consul to give Napoleon most of the powers of a dictator. It was the first constitution since the Revolution that did not include a Declaration of Rights. Additional Act: A document known also as the Charter of 1815, signed on April 22, 1815, which was the French constitution prepared by Benjamin Constant at the request of Napoleon I after he returned from exile on Elba. It extensively amended (in fact virtually replacing) the previous Napoleonic Constitutions (Constitution of the Year VIII, Constitution of the Year X, and Constitution of the Year XII). It was very liberal in spirit and gave the French people rights which were previously unknown to them, such as the right to elect a mayor in communes with populations of fewer than 5,000. Consulate: The government of France from the fall of the Directory in the Coup of 18 Brumaire (1799) until the start of the Napoleonic Empire in 1804. By extension, the term also refers to this period of French history. During this period, Napoleon Bonaparte, as First Consul, established himself as the head of a more liberal, authoritarian, autocratic, and centralized republican government in France while not declaring himself head of state. Despite the failures in Egypt (1798-99), Napoleon arrived in France to a hero’s welcome. He drew together an alliance with director Emmanuel Joseph Sieyès, his brother Lucien, speaker of the Council of Five Hundred Roger Ducos, director Joseph Fouché, and Talleyrand, and they overthrew the Directory by a coup d’état on November 9, 1799 (the Coup of 18 Brumaire), closing down the Council of Five Hundred (the lower house of the legislature). Napoleon became the First Consul for ten years, appointing two consuls with consultative voices only. His power was confirmed by the new Constitution of the Year VIII, originally devised by Sieyès to give Napoleon a minor role, but rewritten by Napoleon and accepted by direct popular vote. The constitution preserved the appearance of a republic but in reality established a dictatorship. The Constitution of the Year VIII was adopted on December 24, 1799 (during the Year VIII of the French Revolutionary Calendar), and established the form of government known as the Consulate. The constitution tailor-made the position of First Consul to give Napoleon most of the powers of a dictator. It was the first constitution since the Revolution that did not include a Declaration of Rights. The new government was composed of three parliamentary assemblies: the Council of State (Conseil d’État), which drafted bills; the Tribunate, which debated bills but could not vote; and the Legislative Assembly ( Corps législatif ), which could not discuss the bills, but whose members voted on them after reviewing the Tribunate’s debate record. The Conservative Senate (Sénat conservateur) was a governmental body equal to the three aforementioned legislative assemblies. However, the Senate was more of an executive body as it verified the draft bills and directly advised the First Consul on their implications. Popular suffrage was retained but mutilated by the lists of notables. The term notables, commonly used under the monarchy, referred to prominent and more affluent men — landholders, merchants, scholars, professionals, clergymen, and officials. The people in each district chose a slate of notables by popular vote. The First Consul, Tribunate, and Corps législatif each nominated one Senatorial candidate to the rest of the Senate, which chose one candidate from among the three. The executive power was vested in three Consuls, but all actual power was held by the First Consul, Bonaparte. Napoleon vetoed Sieyès’ original idea of having a single Grand Elector as supreme executive and Head of State. Sieyès had intended to reserve this important position for himself but by vetoing the proposal, Napoleon helped reinforce the authority of the consuls. However, Napoleon never intended to be part of an equal triumvirate. As the years progressed, he moved to consolidate his own power as First Consul and leave the two other consuls, Jean Jacques Régis de Cambacérès and Charles-François Lebrun, duc de Plaisance, as well as the Assemblies, weak and subservient. By consolidating power, Bonaparte was able to transform the aristocratic constitution of Sieyès into a dictatorship. On February 7, 1800, a public referendum confirmed the new constitution. It vested all the real power in the hands of the First Consul, leaving only a nominal role for the other two consuls. More than 99% of voters approved the motion according to the released results. While this near-unanimity is certainly doubtful, Napoleon was genuinely popular among many voters and after a period of strife, many in France were reassured by his accomplishments in the War of the Second Coalition and his talk of stability of government, order, justice, and moderation. He created the impression that France was governed once more by a real statesman and that a competent government was finally in charge. Napoleon’s government quickly became an authoritarian one-man system, but he surrounded himself with talented and skilled collaborators and experts and supported a merit-based system in the military. Napoleon’s new government, the Consulate, was composed of three parliamentary assemblies: the Council of State, which drafted bills; the Tribunate which debated bills but could not vote; and the Legislative Assembly, which could not discuss the bills, but whose members voted on them after reviewing the Tribunate’s debate record. The Conservative Senate was a governmental body equal to the three aforementioned legislative assemblies. The executive power was vested in three Consuls, but all actual power was held by the First Consul, Bonaparte. In 1802, Napoleon became the First Consul for Life and two years later he was elected as Emperor of the French. As Napoleon increased his power, he borrowed many techniques of the Ancien Régime in his new form of one-man government. Like the old monarchy, he re-introduced plenipotentiaries, an over-centralized, strictly utilitarian administration that constructed or consolidated the funds necessary for national institutions, local governments, a judiciary system, organs of finance, banking, codes, an a conscientious well-disciplined labor force. Napoleon was largely able to quell dissent within government by expelling his more vocal critics. However, he was also able to look beyond partisan and ideological divisions if he recognized exceptional skills and talents that could support his vision of France. The most illustrative example of this phenomenon is his collaboration with Charles Maurice de Talleyrand and Joseph Fouché. In strengthening the machinery of state, Napoleon created the elite order of the Légion d’honneur (The Legion of Honor – a substitute for the old royalist decorations and orders of chivalry, to encourage civilian and military achievements), signed the Concordat, and restored indirect taxes. Of permanent importance was the Napoleonic Code created by eminent jurists under Napoleon’s supervision. Praised for its Gallic clarity, it spread rapidly throughout Europe and the world, marking the end of feudalism where it took effect. The Code recognized the principles of civil liberty, equality before the law, and the secular character of the state. Legion of Honor: The highest French order for military and civil merits, established in 1802 by Napoléon Bonaparte. It was originally established as a substitute for the old royalist decorations and orders of chivalry to encourage civilian and military achievements. Napoleonic Code: The French civil code established under Napoleon I in 1804. It was drafted by a commission of four eminent jurists. With its stress on clearly written and accessible law, it was a major step in replacing the previous patchwork of feudal laws. Historian Robert Holtman regards it as one of the few documents that have influenced the whole world. Concordat: Convention between the Holy See (the Vatican) and a sovereign state that defines the relationship between the Catholic Church and the state in matters that concern both, i.e. the recognition and privileges of the Catholic Church in a particular country and with secular matters that impact on church interests. Napoleon’s new government was composed of three parliamentary assemblies: the Council of State (Conseil d’État), which drafted bills; the Tribunate, which could not vote on the bills but debated them; and the Legislative Assembly (Corps législatif), which could not discuss the bills, but whose members voted on them after reviewing the Tribunate’s debate record. The Conservative Senate (Sénat conservateur) was a governmental body equal to the three aforementioned legislative assemblies. However, the Senate was more of an executive body as it verified the draft bills and directly advised the First Consul on their implications. Popular suffrage was retained but mutilated by the lists of the so-called notables. This term referred to prominent and more affluent men: landholders, merchants, scholars, professionals, clergymen, and officials. The people in each district chose a slate of notables by popular vote. The First Consul, Tribunate, and Corps législatif each nominated one Senatorial candidate to the rest of the Senate, which chose one candidate from among the three. the two other consuls, Jean Jacques Régis de Cambacérès and Charles-François Lebrun, duc de Plaisance, as well as the Assemblies, weak and subservient. In 1802, Napoleon became the First Consul for Life and two years later he was elected as Emperor of the French. His coronation took place in December 1804. Two separate crowns were brought for the ceremony: a golden laurel wreath recalling the Roman Empire and a replica of Charlemagne ‘s crown. Napoleon entered the ceremony wearing the laurel wreath and kept it on his head throughout the proceedings. For the official coronation, he raised the Charlemagne crown over his own head in a symbolic gesture, but never placed it on top because he was already wearing the golden wreath. Instead he placed the crown on Josephine’s head. Napoleon was also crowned King of Italy with the Iron Crown of Lombardy at the Cathedral of Milan in 1805. He created 18 Marshals of the Empire from among his top generals to secure the allegiance of the army. As Napoleon increased his power, he borrowed many techniques of the Ancien Régime in his new form of one-man government. Like the old monarchy, he re-introduced plenipotentiaries, over-centralized, strictly utilitarian administrative and bureaucratic methods, and a policy of subservient pedantic scholasticism towards the nation’s universities. He constructed or consolidated the funds necessary for national institutions, local governments, a judiciary system, organs of finance, banking, codes, and traditions of a conscientious, well-disciplined labor force. Napoleon was largely able to quell dissent within government by expelling his more vocal critics, such as Benjamin Constant and Madame de Staël. However, he was also able to look beyond partisan and ideological divisions if he recognized exceptional skills and talents that could support his vision of France. The most illustrative example of this approach is his relationship with Charles Maurice de Talleyrand, a laicized bishop, politician, and diplomat whose career spanned the regimes of Louis XVI, the years of the French Revolution, Napoleon, Louis XVIII, and Louis-Philippe. Napoleon found him extremely useful and appointed Talleyrand to be his chief diplomat during the years when French military victories brought one European state after another under French hegemony. Most of the time, Talleyrand worked for peace so as to consolidate France’s gains. He succeeded in obtaining peace with Austria through the 1801 Treaty of Luneville and with Britain in the 1802 Treaty of Amiens. He could not prevent the renewal of war in 1803, but by 1805 opposed his emperor’s renewed wars against Austria, Prussia, and Russia. He resigned as foreign minister in 1807, but retained the trust of Napoleon and conspired to undermine the emperor’s plans through secret dealings with Tsar Alexander of Russia and Austrian minister Metternich. Talleyrand sought a negotiated secure peace so as to perpetuate the gains of the French revolution. Napoleon rejected peace and when he fell in 1814, Talleyrand took charge of the Bourbon restoration based on the principle of legitimacy. Portrait of Talleyrand, by Pierre-Paul Prud’hon (1809). The name Talleyrand has become a byword for crafty, cynical diplomacy. Talleyrand polarizes scholarly opinion. Some regard him as one of the most versatile, skilled, and influential diplomats in European history, and some believe that he was a traitor, betraying the Ancien Régime, the French Revolution, Napoleon, and the Restoration. The services of talented politicians were so important to Napoleon that he was able to force his collaborators to work above their own political differences and personal animosities. Arguably the second most important person in his government, Joseph Fouché, was Talleyrand’s opponent, yet the two served together under Napoleon. Fouché was careful to temper Napoleon’s more arbitrary actions, which at times won him the gratitude even of the royalists. Fouché was thought to have saved the Jacobins from the vengeance of the Consulate and Bonaparte decided to rid himself of a man who had too much power to be desirable as a subordinate. On the proclamation of Bonaparte as First Consul for life (1802), Fouché was deprived of his office of minister of police. After the proclamation of the First French Empire, Fouché again became head of the re-constituted ministry of police (1804) and later of Internal Affairs, with activities as important as those carried out under the Consulate. His police agents were ubiquitous and the terror that Napoleon and Fouché inspired partly accounts for the absence of conspiracies after 1804. The two remained distrustful of each other and by the end of Napoleon’s rule, Fouché, seeing the fall of the emperor to be imminent, took measures to expedite it and secure his own interests. 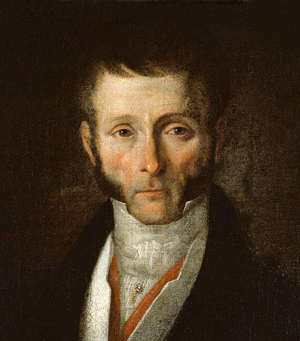 Portrait of Joseph Fouché by an unknown artist. : Fouché, once a revolutionary using extreme terror against the Bourbon supporters, later initiated a campaign of White Terror against real and imaginary enemies of the Royalist restoration (officially directed against those who had plotted and supported Napoleon’s return to power). Even Prime Minister Talleyrand disapproved of such practices. In strengthening the machinery of state, Napoleon created the elite order of the Légion d’honneur (The Legion of Honor – a substitute for the old royalist decorations and orders of chivalry, to encourage civilian and military achievements), signed the Concordat, and restored indirect taxes, an act seen as a betrayal of the Revolution. He centralized power in Paris, with all the provinces governed by all-powerful prefects he selected. They were more powerful than royal intendants of the Ancien Régime and had a long-term impact on minimizing regional differences and shifting all decisions to Paris. The French taxation system had collapsed in the 1780s, one of the key factors leading to the Revolution. Napoleon instituted a modern, efficient tax system that guaranteed a steady flow of revenues and made long-term financing possible. He also reformed the army, most notably the system of conscription created in the 1790s, which enabled every young man, regardless of his economic or social background, to serve in the army. Consequently, the army expanded rapidly. Before the Revolution, the aristocracy formed the officer corps. Now promotion was by merit and achievement— it was assumed that every private could reach the ranks of the officer. Napoleon also resolved most of the outstanding problems resulting from the complex history of religious tensions and conflicts in France. He moved the clergy and large numbers of devout Catholics from hostility to the government to support for him after the Catholic system was reestablished by the Concordat of 1801 (signed with Pope Pius VII) that allowed the Church return to normal operations. The church lands were not restored, but the Jesuits were allowed to return and the bitter fights between the government and the Church ended. Protestant, Jews, and atheists were tolerated. Napoleon’s decisions to reinstate slavery in French colonies and sell the Louisiana territory to the United States, together with the triumph of the Haitian Revolution, made his colonial policies some of the greatest failures of his rule. In the middle of the 18th century, a series of colonial conflicts began between France and Britain, ultimately resulting in the destruction of most of the existing French colonial empire and the near complete expulsion of France from the Americas. Modest recovery of the French colonial empire was made during the French intervention in the American Revolution, with Saint Lucia returned to France by the Treaty of Paris in 1783. The end of France’s first colonial empire began in 1791 when Saint Domingue was torn apart by a massive slave revolt ( Haitian Revolution ). The French attempt to establish a colony in Egypt in 1798–1801 under the military leadership of Napoleon failed. During the following years Napoleon, already the ruler of France, did not manage to turn the country into an important colonial power. A brief peace in Europe allowed Napoleon to focus on the French colonies. Saint-Domingue managed to acquire a high level of political autonomy during the Revolutionary Wars, with Toussaint Louverture installing himself as de facto dictator by 1801. Napoleon saw his chance to recuperate the wealthy colony when he signed the Treaty of Amiens. During the Revolution, the National Convention voted to abolish slavery in 1794. Under the terms of Amiens, however, Napoleon agreed to appease British demands by not abolishing slavery in any colonies where the 1794 decree had never been implemented. The resulting Law of May 20 thus technically reestablished slavery in some French colonies. Although the French managed to capture Toussaint Louverture, the expedition failed when high rates of disease crippled the French army. In May 1803, the last 8000 French troops left the island and the slaves proclaimed an independent republic that they called Haïti in 1804. Seeing the failure of his colonial efforts, Napoleon decided in 1803 to sell the Louisiana Territory to the United States. At the close of the Napoleonic Wars, most (although not all) of France’s colonies were restored to it by Britain. Napoleonic Wars: A series of major global conflicts pitting the French Empire, led by Napoleon I, against an array of European powers formed into various coalitions between 1803 and 1815. They revolutionized European armies and played out on an unprecedented scale, mainly owing to the application of modern mass conscription. The wars were a continuation of the Revolutionary Wars, which broke out in 1792 during the French Revolution. Louisiana Purchase: The acquisition of the Louisiana territory (828,000 square miles) by the United States from France in 1803. The U.S. paid 50 million francs ($11.25 million USD) and a cancellation of debts worth 18 million francs ($3.750 million USD) for a total of 68 million francs ($15 million USD). The Louisiana territory included land from 15 present U.S. states and two Canadian provinces. Law of May 20: A law passed in 1802 that revoked the Law of February 4, 1794, which had abolished slavery in all the French colonies. It explicitly concerned the territories, where the 1794 law had not been applied, and was linked to the 1802 Treaty of Amiens which restored Martinique to France. The 1802 law thus did not apply to Guadeloupe and Guyane and had little effect in Saint-Domingue except to re-inflame rebellion and accelerate its march towards independence in 1804. Haitian Revolution: A successful anti-slavery and anti-colonial insurrection that took place in the former French colony of Saint Domingue from 1791 until 1804. It impacted the institution of slavery throughout the Americas. Self-liberated slaves destroyed slavery at home, fought to preserve their freedom, and collaborated with mulattoes to found the sovereign state of Haiti. In the middle of the 18th century, a series of colonial conflicts began between France and Britain that ultimately resulted in the destruction of most of the existing French colonial empire and the near complete expulsion of France from the Americas. The Seven Years’ War (1756-63) was a particularly bad defeat for the French, with the numerically superior British conquering not only New France (excluding the small islands of Saint Pierre and Miquelon), but also most of France’s West Indian (Caribbean) colonies and all of the French Indian outposts. While the following peace treaty saw France’s Indian outposts and the Caribbean islands of Martinique and Guadeloupe restored to France, the competition for influence in India was won by the British and North America was entirely lost. Most of New France was taken by Britain (except Louisiana, which France ceded to Spain as payment for Spain’s late entrance into the war and as compensation for Britain’s annexation of Spanish Florida). Also ceded to the British were Grenada and Saint Lucia in the West Indies. Although the loss of Canada would cause regret in future generations, it did not seem like a French failure at the time. Colonialism was widely regarded as largely unimportant to France. Modest recovery of the French colonial empire was made during the French intervention in the American Revolution, with Saint Lucia returned to France by the Treaty of Paris in 1783. The end of what remained of France’s first colonial empire began in 1791 when Saint Domingue (the Western third of the Caribbean island of Hispaniola), France’s richest and most important colony, was torn apart by a massive slave revolt (Haitian Revolution). Saint-Domingue slave revolt in 1791 (Haitian Revolution), German copper engraving, author unknown. : Napoleon’s role in the Haitian Revolution and decision to reinstate slavery in France’s oversea colonies remain controversial and affect his reputation as one of the most brilliant rulers in global history. The French attempt to establish a colony in Egypt in 1798–1801 under the military leadership of Napoleon failed. During the years to come Napoleon, already the ruler of France, did not manage to turn the country into an important colonial power. After a decade of constant warfare, France and Britain signed the 1802 Treaty of Amiens, bringing the French Revolutionary Wars to an end. Amiens called for the withdrawal of British troops from recently conquered colonial territories as well as for assurances to curtail the expansionary goals of the French Republic. With Europe at peace and the economy recovering, Napoleon’s popularity soared to its highest levels under the Consulate, both domestically and abroad. This brief peace in Europe allowed Napoleon to focus on the French colonies. Saint-Domingue managed to acquire a high level of political autonomy during the Revolutionary Wars, with Toussaint Louverture installing himself as de facto dictator by 1801. Napoleon saw his chance to recuperate the wealthy colony when he signed the Treaty of Amiens. During the Revolution, the National Convention voted to abolish slavery in 1794. Under the terms of Amiens, however, Napoleon agreed to appease British demands by not abolishing slavery in colonies where the 1794 decree had never been implemented. The resulting Law of May 20 never applied to colonies like Guadeloupe or Guyane, even though rogue generals and other officials used the pretext of peace as an opportunity to reinstate slavery in some of these places. The Law of May 20 officially restored the slave trade to the Caribbean colonies, not slavery itself. Napoleon sent an expedition under General Leclerc designed to reassert control over Sainte-Domingue. Although the French managed to capture Toussaint Louverture, the expedition failed when high rates of disease crippled the French army. In May 1803, the last 8,000 French troops left the island and the slaves proclaimed an independent republic that they called Haïti in 1804. Seeing the failure of his colonial efforts, Napoleon decided in 1803 to sell the Louisiana Territory to the United States, instantly doubling the size of the U.S. The selling price in the Louisiana Purchase was less than three cents per acre, a total of $15 million. At the close of the Napoleonic Wars, most of France’s colonies were restored to it by Britain, notably Guadeloupe and Martinique in the West Indies, French Guiana on the coast of South America, various trading posts in Senegal, the Île Bourbon (Réunion) in the Indian Ocean, and France’s tiny Indian possessions. However, Britain finally annexed Saint Lucia, Tobago, the Seychelles, and the Isle de France (now Mauritius). The Concordat of 1801 sought national reconciliation between revolutionaries and Catholics and solidified the Roman Catholic Church as the majority church of France. But while it restored France’s ties to the papacy, it was largely in favor of the state. During the French Revolution, the National Assembly took Church properties and issued the Civil Constitution of the Clergy, which made the Church a department of the state, effectively removing it from papal authority. These and other decisions that aimed to weaken the position of the Catholic Church in France triggered some social unrest. The Concordat was designed to regulate relations between Napoleon’s France and the Catholic Church. It was drawn up by a commission with three representatives from each party and signed in 1801 in Paris. It sought national reconciliation between revolutionaries and Catholics and solidified the Roman Catholic Church as the majority church of France, with most of its civil status restored. While the Concordat restored some ties to the papacy, it was largely in favor of the state. It wielded greater power of the state vis-à-vis the Pope than previous French regimes, and church lands lost during the Revolution were not returned. Napoleon understood the utility of religion as a factor of social cohesion, and his approach was utilitarian. He could now win favor with French Catholics while also controlling Rome in a political sense. Napoleon looked for recognition by the Church of the disposition of its property and geographical reorganization of bishoprics, while Rome sought the protection of Catholics and the recognition of a special status of the Catholic Church in the French State. As a part of the Concordat, Napoleon presented another set of laws called the Organic Articles. They were published as a unilateral addition to the Concordat in 1802. Presenting the Organic Articles was Napoleon’s method of granting the Tribunate and the legislative body partial control of the Concordat in order to help the state monitor any politically harmful Catholic or Protestant movements or activities. The hostility of devout Catholics against the state was now largely resolved. The Concordat did not restore the vast church lands and endowments that were seized during the revolution and sold off. Catholic clergy returned from exile or hiding and resumed their traditional positions in their traditional churches. While the Concordat restored much power to the papacy, the balance of church-state relations tilted firmly in Napoleon’s favor. Gallican Church: The Roman Catholic Church in France from the time of the Declaration of the Clergy of France (1682) to that of the Civil Constitution of the Clergy (1790) during the French Revolution. Organic Articles: An 1801/02 law administering public worship in France. It was presented by Napoleon Bonaparte and consisted of 77 Articles relating to Catholicism and 44 Articles relating to Protestantism. The Concordat of 1801: An agreement between Napoleon and Pope Pius VII signed in July 1801 in Paris that remained in effect until 1905. It sought national reconciliation between revolutionaries and Catholics and solidified the Roman Catholic Church as the majority church of France, with most of its civil status restored. Civil Constitution of the Clergy: A law passed in July 1790 during the French Revolution that subordinated the Roman Catholic Church in France to the French government. During the French Revolution, the National Assembly took Church properties and issued the Civil Constitution of the Clergy, which made the Church a department of the state and effectively removed it from papal authority. At the time, the nationalized Gallican Church was the official church of France. Gallicanism was the theory that the power of monarchs is independent of the power of popes and that the church of each country should be under the joint control of the pope and the monarch, but the doctrine of the Gallican Church was essentially Catholicism. The Civil Constitution caused hostility among the Vendée resurgents, who resented the harsh conditions imposed on the Roman Catholic Church by the provisions of the Civil Constitution and broke into open revolt after the Revolutionary government’s imposition of military conscription. A guerrilla war known as the Revolt in the Vendée was led at the outset by peasants who were chosen in each locale. It cost more than 240,000 lives before it ended in 1796. Subsequent laws abolished the traditional Gregorian calendar and Christian holidays. The Concordat was drawn up by a commission with three representatives from each party. Napoleon Bonaparte, who was First Consul of the French Republic at the time, appointed Joseph Bonaparte, his brother, Emmanuel Crétet, a counselor of state, and Étienne-Alexandre Bernier, a doctor in theology. Pope Pius VII appointed Cardinal Ercole Consalvi, Cardinal Giuseppe Spina, archbishop of Corinth, and his theological adviser, Father Carlo Francesco Maria Caselli. The French bishops, whether abroad or back to their own countries, had no part in the negotiations. The Concordat of 1801 was signed in Paris. It sought national reconciliation between revolutionaries and Catholics and solidified the Roman Catholic Church as the majority church of France, with most of its civil status restored. While the Concordat restored some ties to the papacy, it was largely in favor of the state. It wielded greater power of the state vis-à-vis the Pope than previous French regimes, and church lands lost during the Revolution were not returned. Napoleon understood the utility of religion as an important factor of social cohesion and his approach was utilitarian. He could now win favor with French Catholics while also controlling Rome politically. A declaration that “Catholicism was the religion of the great majority of the French” but not the official state religion, thus maintaining religious freedom for Protestants and other French citizens. The Papacy had the right to depose bishops, but this made little difference because they were still nominated by the French government. The state paid clerical salaries and the clergy swore an oath of allegiance to the state. Sunday was reestablished as a “festival.” The rest of the French Republican Calendar was not replaced by the traditional Gregorian Calendar until January 1, 1806. Leaders of the Catholic Church taking the civil oath required by the Concordat of 1801, Henri Gourdon de Genouillac, Paris à travers les siècles, v. 4, Paris, F. Roy, 1881. In the aftermath of signing the Concordat of 1801, the Catholic clergy returned from exile or hiding and resumed their traditional positions in their traditional churches. Very few parishes retained the priests who had accepted the “Civil Constitution of the Clergy.” Napoleon and the pope both found the Concordat useful. Similar arrangements were made with the Church in territories controlled by Napoleon, especially Italy and Germany. As part of the Concordat, Napoleon presented another set of laws called the Organic Articles. These consisted of 77 Articles relating to Catholicism and 44 Articles relating to Protestantism and were published as a unilateral addition to the Concordat in 1802. Napoleon presented the set of laws to the Tribunate and the legislative body at the same time that he had them vote on the Concordat itself. It met with opposition from the Catholic Church with Pope Pius VII claiming that the articles had been promulgated without his knowledge. Presenting the Organic Articles was Napoleon’s method of granting the Tribunate and the legislative body partial control of the Concordat to help the state monitor any politically harmful Catholic or Protestant movements or activities. The hostility of devout Catholics against the state was now largely resolved. The Concordat did not restore the vast church lands and endowments that were seized upon during the revolution and sold off. Catholic clergy returned from exile or hiding, and resumed their former positions in their traditional churches. While the Concordat restored much power to the papacy, the balance of church-state relations tilted firmly in Napoleon’s favor. He selected the bishops and supervised church finances. Similar arrangements were made with the Church in territories controlled by Napoleon, especially Italy and Germany. The Concordat was abrogated by the law of 1905 on the separation of Church and state. However, some provisions of the Concordat are still in effect in the Alsace-Lorraine region under the local law of Alsace-Moselle, as the region was controlled by the German Empire at the time of the 1905 law’s passage. 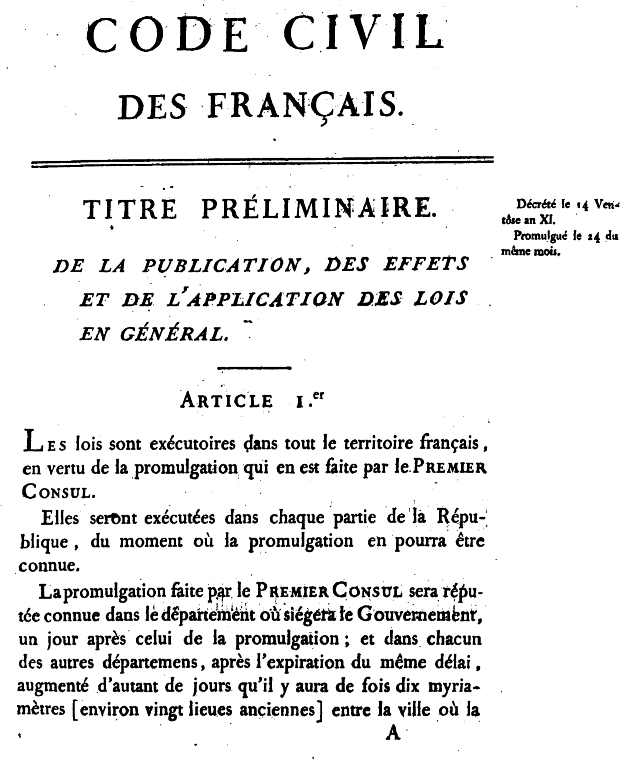 The 1804 Napoleonic Code, which influenced civil law codes across the world, replaced the fragmented laws of pre-revolutionary France, recognizing the principles of civil liberty, equality before the law (although not for women in the same sense as for men), and the secular character of the state. Napoleon set out to reform the French legal system in accordance with the ideas of the French Revolution. Before the Napoleonic Code, France did not have a single set of laws. Law consisted mainly of local customs, which had sometimes been officially compiled in “customals.” There were also exemptions, privileges, and special charters granted by the kings or other feudal lords. Specifically, Jean-Jacques Régis de Cambacérès led the drafting process of a single civil law code. His drafts of 1793, 1794, and 1799, however, were adopted only partially. When Napoleon came to power in 1799, a commission of four eminent jurists was appointed in 1800, chaired by Cambacérès (now Second Consul) and sometimes by the First Consul, Napoleon himself. The Code was complete by 1801 but not published until 1804. Napoleon participated actively in the sessions of the Council of State that revised the drafts of the new civil code. The development of the code was a fundamental change in the nature of the civil law legal system as it stressed clearly written and accessible law. Other codes were commissioned by Napoleon to codify criminal and commerce law. Praised for its clarity, the Code spread rapidly throughout Europe and the world and marked the end of feudalism and the liberation of serfs where it took effect. The Code recognized the principles of civil liberty, equality before the law (although not for women in the same sense as for men), and the secular character of the state. Although the Napoleonic Code was not the first civil code and did not represent the whole of Napoleon’s empire, it was one of the most influential. It was adopted in many countries occupied by the French during the Napoleonic Wars. It formed the basis of the law systems across most of continental Europe and has had a lasting impact on civil law codes in other regions of the world, including the Middle East where it has been combined with the Islamic law. The development of the Napoleonic Code was a fundamental change in the nature of the civil law system, making laws clearer and more accessible. It also superseded the former conflict between royal legislative power and, particularly in the final years before the Revolution, protests by judges representing views and privileges of the social classes to which they belonged. Napoleonic Code: The French civil code established under Napoleon I in 1804. It was drafted by a commission of four eminent jurists. The code, with its stress on clearly written and accessible law, was a major step in replacing the previous patchwork of feudal laws. Historian Robert Holtman regards it as one of the few documents that have influenced the whole world. Council of State: A body of the French national government that acts both as legal adviser of the executive branch and as the supreme court for administrative justice. Originally established in 1799 by Napoleon Bonaparte as a successor to the King’s Council and a judicial body mandated to adjudicate claims against the State and assist in the drafting of important laws. Napoleon set out to reform the French legal system in accordance with the ideas of the French Revolution. Before the Napoleonic Code, France did not have a single set of laws. Law consisted mainly of local customs, which had sometimes been officially compiled in “customals” (coutumes). There were also exemptions, privileges, and special charters granted by the kings or other feudal lords. During the Revolution, the last vestiges of feudalism were abolished and a new legal code was required to address changes in the social, economic, and political structure of French society. Jean-Jacques Régis de Cambacérès led the drafting process of a single civil law code. His drafts of 1793, 1794, and 1799, however, were adopted only partially. When Napoleon came to power in 1799, a commission of four eminent jurists was appointed in 1800, chaired by Cambacérès (now Second Consul) and sometimes by the First Consul, Napoleon himself. The Code was complete by 1801, after intensive scrutiny by the Council of State, but was not published until 1804. It was promulgated as the Civil Code of the French (Code civil des Français), but was renamed the Napoleonic Code (Code Napoléon) from 1807 to 1815, and once again after the Second French Empire (1852-71). Napoleon participated actively in the sessions of the Council of State that revised the drafts of the new civil code. The development of the code was a fundamental change in the nature of the civil law legal system as it stressed clearly written and accessible law. Other codes were commissioned by Napoleon to codify criminal and commerce law. The preliminary article of the Code established certain important provisions regarding the rule of law. Laws could be applied only if they had been duly promulgated and then published officially (including provisions for publishing delays, given the means of communication available at the time). Thus, no secret laws were authorized. It prohibited ex post facto laws (i.e. laws that apply to events that occurred before their introduction). The code also prohibited judges from refusing justice on grounds of insufficiency of the law, thereby encouraging them to interpret the law. On the other hand, it prohibited judges from passing general judgments of a legislative value (more below). With regard to family, the Code established the supremacy of the man over the wife and children, which was the general legal situation in Europe at the time. Praised for its clarity, the Code spread rapidly throughout Europe and the world in and marked the end of feudalism and the liberation of serfs where it took effect. The Code recognized the principles of civil liberty, equality before the law (although not for women in the same sense as for men), and the secular character of the state. It discarded the old right of primogeniture (where only the eldest son inherited) and required that inheritances be divided equally among all children. The court system was standardized. All judges were appointed by the national government in Paris. First page of the 1804 original edition of the Napoleonic Code. The Napoleonic Code was not the first legal code to be established in a European country with a civil legal system. It was preceded by the Codex Maximilianeus bavaricus civilis (Bavaria, 1756), the Allgemeines Landrecht (Prussia, 1794), and the West Galician Code (Galicia, then part of Austria, 1797). It was, however, the first modern legal code to be adopted with a pan-European scope and strongly influenced the law of many of the countries formed during and after the Napoleonic Wars. The Napoleonic Code was very influential in developing countries outside Europe, especially in the Middle East, that were attempting to modernize through legal reforms. Although the Napoleonic Code was not the first civil code and did not represent the whole of Napoleon’s empire, it was one of the most influential. It was adopted in many countries occupied by the French during the Napoleonic Wars and thus formed the basis of the law systems of Italy, the Netherlands, Belgium, Spain, Portugal (and their former colonies), and Poland (1808–1946). In the German regions on the west bank of the Rhine (Rhenish Palatinate and Prussian Rhine Province), the former Duchy of Berg, and the Grand Duchy of Baden, the Napoleonic Code was in use until the introduction in 1900 of the first common civil code for the entire German Empire. A civil code with strong Napoleonic influences was also adopted in 1864 in Romania and remained in force until 2011. The Code was adopted in Egypt as part of the system of mixed courts introduced in Egypt after the fall of Khedive Ismail (1879). In the Persian Gulf Arab states of the Middle East, the influence of the Napoleonic Code mixed with hints of Islamic law is clear even in Saudi Arabia (which abides more towards Islamic law). In Kuwait, for example, property rights, women’s rights, and the education system were seen as Islamic reenactments of the French civil code. Thus, the civil law systems of the countries of modern continental Europe, with the exception of Russia and the Scandinavian countries have, to different degrees, been influenced by the Napoleonic Code. In the United States, whose legal system is largely based on English common law, the state of Louisiana is unique in having a strong influence from the Napoleonic Code and Spanish legal traditions on its civil code. The development of the Napoleonic Code was a fundamental change in the nature of the civil law system, making laws clearer and more accessible. It also superseded the former conflict between royal legislative power and, particularly in the final years before the Revolution, protests by judges representing views and privileges of the social classes to which they belonged. Such conflict led revolutionaries to take a negative view of the judges and the judicial system. This is reflected in the Napoleonic Code provision prohibiting judges from deciding a case by way of introducing a general rule, since the creation of general rules is an exercise of legislative, not judicial power. In theory, there is thus no case law in France. However, the courts still had to fill in the gaps in the laws and regulations and, indeed, were prohibited from refusing to do so. Moreover, both the code and legislation have required judicial interpretation. Thus, a vast body of judicially-created law (jurisprudence) has come into existence. There is no rule of stare decisis (binding precedent) in French law, but decisions by important courts have become more or less equivalent to case law.